NASA has dramatically changed its mind about the risks posed by asteroid 2013 TX68 , a 100ft-wide rock which is currently heading towards Earth. It said there was “a chance” it could plough into our planet next year when it makes another flyby. However, we are glad to report that NASA thinks the odds of a collision on September 28, 2017, are “no more than 1-in-250-million”. It it did hit the planet, the asteroid would probably explode in the atmosphere, unleashing as much energy as a powerful nuclear bomb and wiping out anything unlucky enough to be beneath it. “The possibilities of collision on any of the three future flyby dates are far too small to be of any real concern,” said Paul Chodas, manager of NASA’s Center for near earth orbit studies . Late last night, NASA published a tweet in which it claimed that Earth would be safe from this asteroid for at least the next century. However, astronomers cannot precisely predict its movements and have given it a “condition code” of eight out of a possible 10, which means they cannot accurately predict its movements. 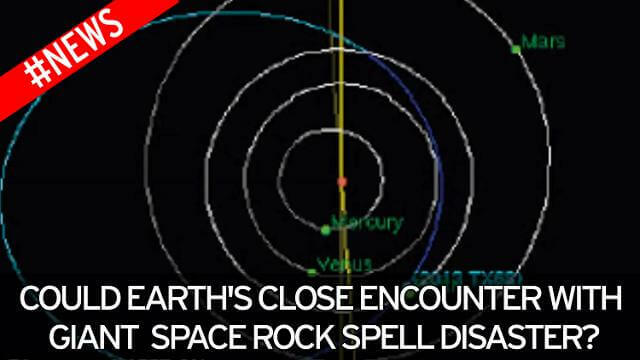 Experts cannot say for sure whether the space rock will zoom by at the terrifyingly close distance of 11,000 miles – or fly wide of the planet by 1.3 million miles. “This asteroid’s orbit is quite uncertain, and it will be hard to predict where to look for it,” Chodas added. The asteroid has become something of an internet star, with one joker giving the space rock its very own Twitter feed . It has also become the subject of a number of bizarre theories suggesting the world is about to end. Just picked up a radio transmission of something called The Kardashians. That's my life now. This Bruce guy is hench. Some conspiracy theorists claimed the Messiah could arrive after the asteroid plunges into Earth, followed by a secret planet called Nibiru. Others claim NASA is covering up the true risk posed by TX 68. In a rather incoherent and badly-spelt response to NASA’s tweet last night, one fearful man wrote: “100 years of notin!? If there was sumit wud ppl b told?